International Criminal Court prosecutor Luis Moreno Ocampo has said that he would not even read the UN report on Sri Lanka as Sri Lanka is not a member state of the ICC. However he added that the ICC is checking the filing on Permanent Representative of Sri Lanka to the UN Palitha Kohona as he is a dual citizen of Autralia. The Inner City Press reported today that in a interview with International Criminal Court prosecutor Luis Moreno Ocampo at the UN on Wednesday, Ocampo when questioned on the UN report on Lanka dismissively said that he would not read it. He said he is the prosecutor for 115 ICC member states. Sri Lanka is not a member, he added. Asking him about the Sri Lanka report is like asking a United Kingdom prosecutor about alleged crimes outside his responsibility, Ocampo said. Inner City Press asked Ocampo, what about people described in the report who are dual citizens of countries which are members of the ICC, like Palitha Kohona, joint Australian citizen involved in the so-called White Flag case, to which Ocampo said that they have received something on that. “We are checking that,” Ocampo said. On February 22 International media reported that, two international Tamil organisations have made a series of war crimes allegations to the International Criminal Court involving Dr Kohona and his role in the negotiated surrender of three Tamil Tigers who are believed to have been killed. While Sri Lanka does not recognise the jurisdiction of the court, Dr Kohona’s citizenship of Australia - a country which is a party to the court - means unlike other senior members of the Sri Lankan government, he can potentially be prosecuted, reports add. That does not mean that a full investigation is likely, however, as only a very few of the requests for prosecutions each year are pursued by the court. Dr Kohona became an Australian citizen in the 1980s while working in Canberra with the Foreign Affairs Department. 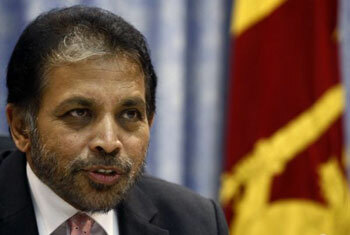 He is now the Sri Lankan government’s representative at the United Nations.